Corner Unit on the 4th Floor with Fabulous View. Private Balcony! --Corner unit on the 4th Floor. Overlooking the pool and pristine Treasure Island Beach. --Large beachfront stateroom features a King size bed and a full size pull-out couch. --Resort amenities: heated pool, poolside Tiki Bar, BBQ grills on the beach, and of course, incredible sunset views from your private balcony. --Resort includes private dock. Small boat dockage available. 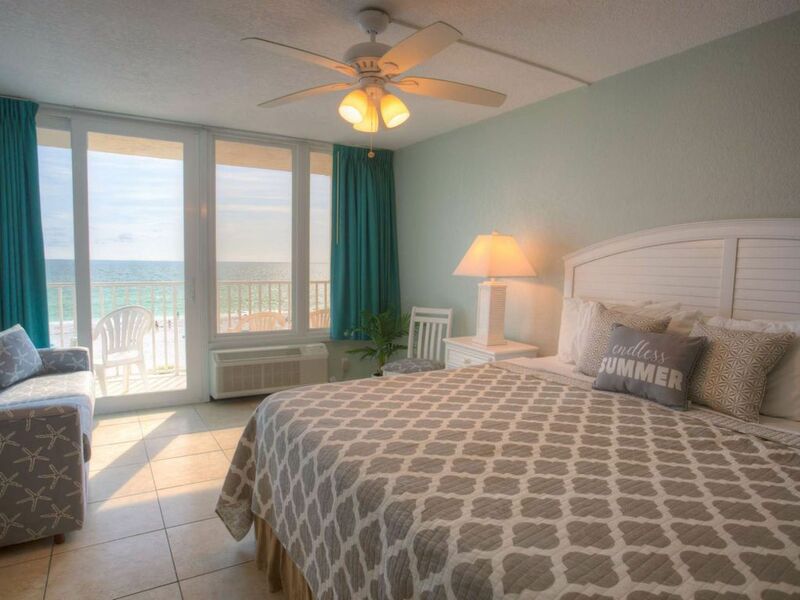 --Includes linens and towels, beach towels, beach chairs, pots, pans, toaster, coffee maker, 37" flat screen TV with DVD player, cable TV, pots, pans, hairdryer, and iron and board. Just bring along your bathing suit and you're all set. --It's the perfect location for a short getaway, or an extended stay. --Nearby activities include sailing, kayaking, biking, shopping, parasailing, jet skiing, boat rentals, shopping, or fine dining. If you're more of a sports fan, catch a game with the Tampa Bay Buccaneers, Tampa Bay Lightning, Tampa Bay Rays, or one of the many teams that visit the area for Spring Training. Visit world-class museums, exciting concerts, or historic Florida landmarks. There's always something to do. As advertised. Corner unit with a balcony overlooking the beach. It was clean, a nice facility with a little bar and pool area. Within walking distance of nice restaurants. We would stay again. Very clean and updated. Perfect for a couple. Overall the property was nice. We loved our condo and would love to rent it again next year! The only thing that we found was the comforter was ripped at the bottom. Due to the rip it was a constant reminder that it may cause a tripping hazard. We tucked it underneath to avoid this. Otherwise it was a beautiful view of the gulf. The tiki bar below was a fun time and allowed us to grab a snack or beverage while staying near the pool and beach. This was an overall exceptional experience and will likely be coming back hopefully to this specific condo in the future! Nice property. Pool inviting. Tiki bar a great amenity. Great for the price. Overall what we expecte. If you don’t like pool or bar noise do not stay in this unit. Accommodations were perfect. Gorgeous sunsets and precious time with my daughter. Pool was great and there is a snack bar for drinks and snacks which was super convenient. Bartender was super nice and staff at the condo was very helpful.